So I have a few questions to pose, about how to best use WordPress. I had grown accustomed to blogger and had set up a fairly nice little site, but I kept hearing rumblings that WordPress was a better service. Figuring I wanted to start fresh anyways I came over here and set myself up. While I like little things such as being able to use a custom picture for my header, I miss being able to use java and html code on the main page. Back on blogger I had my XBox Live tag set up, along with a mini Xfire profile. Is there anyway to do this on WordPress? Am I just missing a widget, or not doing something right? 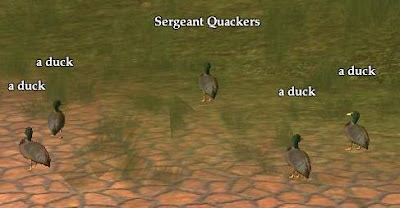 Oh Sergeant Quackers, how you amuse me..
Anyways, quick update. Jerrek is level 27 now, on top of logging back in and NOT being in the jail cell area (I had logged out after being ‘abducted’) I had come to the knowledge that it was not in fact a part of the Splitpaw Saga content at all. Never the less I ended up buying it, and have run through the access quest twice, but each time I do the new crystal I receive just disappears instead of creating a new one with the old one. This means I cannot enter the upper tunnels, thus I cannot access the content I just paid $8 for. I’ve petitioned Sony, and instead of an in game petition it seems I have some online form thing I had to fill out and they will email me with a response. How this will all work itself out in this fashion I don’t know. I just hope it does.. In other news I did not start playing Gun yet, but that is what I am literally going to sit down and do, RIGHT NOW. Seriously! Quickly though I want to mention a new toy I received yesterday. I’ve talked about in the passed how much I listen to podcasts, and take my Ipod with me everywhere. While having my headphones in helped me focus on what was being talked about, it literally blocked out everything else, including the world around me. To combat this problem I picked up an iHome 2go. This, I believe, is from the same people who release those expensive iHome speaker systems. Well this little guy was only $50, and it packs quite an audio punch. What is even better about it is that the iPod itself is tucked safely inside of the unit, which happens to be a water repellent casing, although it has openings, so don’t plan on it surviving a dunk in the pool. All of the volume, pause, forward back and on and off buttons are on the front of the case, and a handy little hold option is just a flip away on the top under a Velcro pad that also gives you access to a headphones jack, the DC power jack (which also charges your iPod when it is plugged in) and a line in jack for other MP3 players that don’t use the iPod plug. It runs on four AA batteries, and when they are dead it really lets you know because the audio just goes to hell. Thankfully I only found that out after using uncharged rechargeable batteries. Nice little product, I haven’t had much of a chance to use it outside of my desk yet, but I’ll let you know how it works out in other areas later.